The café serves breakfast between 10am and 12pm and lunch between 12pm and 3pm. Tea, coffee and cake are available all day. 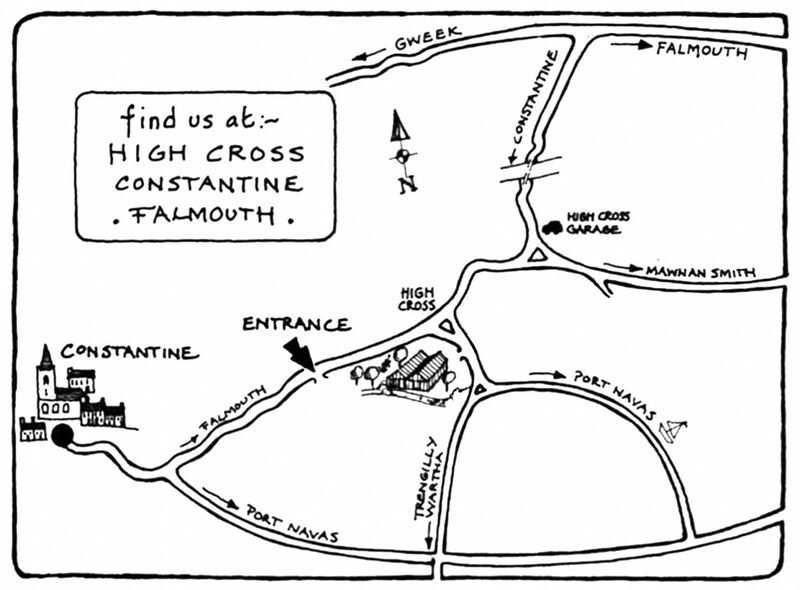 Potager is on the road between Falmouth and Constantine, a mile from Constantine. Use our postcode – TR11 5RF – in sat navs and follow signs when you get close. If you get lost, do give us a call on 01326 341258 for directions! First KERNOW operate the number 35 bus which travels between Helston and Falmouth. Just ask the driver to let you off at High Cross (between Treverva and Constantine). At Potager we’ve been making improvements over the years to increase the accessibility of the site. Visitors with limited mobility should follow signs for ‘accessible parking’ and use our top car park. From here access to the café is by a compacted gravel path. The café is fully accessible and there is an accessible unisex toilet in the building. Most of the garden is accessible by gently sloping paths and steps can be avoided. If you have any questions, do please give us a call on 01326 341258 or contact us by email. Well behaved dogs are welcome at Potager. We do ask you to keep them on a lead at all times.